Every weekend thousands of walkers and climbers migrate to the glorious Torridon mountains. Here you'll find some of the most spectacular upland scenery in the country and there's no finer peak to tackle - whether its your first foray into the area or the latest rendezvous with a land you've come to know and love - than Beinn Alligin. 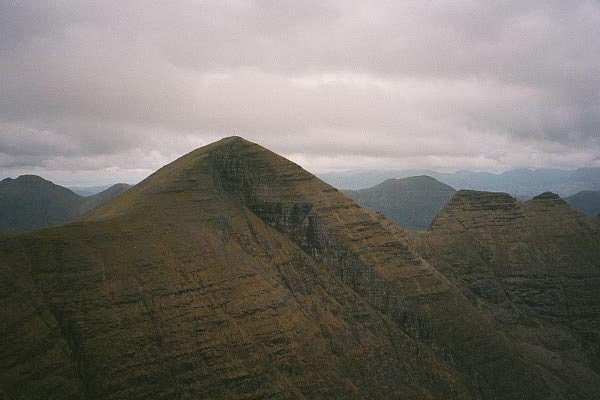 Famous for its castellated ridge - the Horns of Alligin - the ascent of the two Munros - Tom na Gruagaich and Sgurr Mhor - is straightforward enough and within the grasp of all experienced hillwalkers. 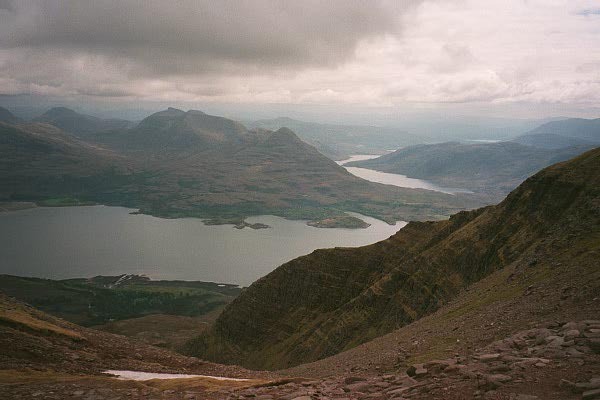 The least difficult of the three main Torridon mountains - Beinn Alligin, Liathach and Beinn Eighe - it is a recommended starting point for those new to the area. The Horns, however, add an extra element of excitement and are strictly for competent scramblers. From the tiny walkers' car park, a path leaves the road to the left of the burn. It climbs over heather moorland and a couple of rocky outcrops before skirting up into Coir' nan Laogh. The way rises quite steeply here, staying to the right of the tumbling burn and passing through the shadows of some impressive high crags. It zig-zags over an area of eroded ground at the top, emerging on to a plateau. 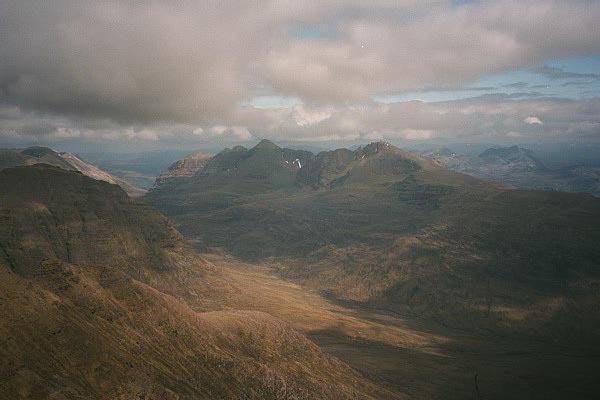 The top of Tom na Gruagaich, elevated to Munro status in the 1997 review, is just a short walk away. Standing at the trig point is an airy experience and certainly not one recommended for those with no head for heights. The north east face, clad in an armour of rock slabs, plunges straight down into Toll a'Mhadaidh. However, the path descends over the less severe but rather narrow north ridge to a col where the crest broadens before rising on to Sgurr Mhor. Just below the summit, you can't miss the deep gash of Eag Dhubh. The name translates from the Gaelic as the black cleft. This sheer-sided slash in the hillside drops right through to the coire below and is breath-taking. The climb on to Sgurr Mhor skirts round the top of of Eag Dubh to reach a large cairn where spectacular views await. With the two Munros under your belt, the easiest way home it to retrace your steps over Tom na Gruagaich and return by the route of ascent. Experienced hillwalkers longing for a challenge will, however, want to continue with a traverse of Na Rathanan, the Horns of Alligin. A steep descent over a narrow ridge drops east from the summit of Sgurr Mhor to the col below. From there, an obvious path rises on to the first of the three horns, twisting its way up through rocky outcrops to the top. Once you are on the ridge there is no way off - you either turn back or press on. The path continues to scramble over the next two tops before you can at last relax and breath a sigh of relief. From the end of the crest a path descends south east over the broad flank to meet up with a stalker's path in the base of the glen. It follows the Abhainn Coire Mhic Nobuil down to the car park. Start/parking Small public car park by the bridge above Torridon House, on the Torridon to Diabeg road. GR: 866613. Grading The two Munros offer a fine introduction to Torridon and are attainable by all experienced, well equipped hillwalkers. A traverse of the Horns of Alligin (optional) requires some moderate, although exposed scrambling. In winter the ridge is a serious proposition for experienced mountaineers.